I’m an old hack, literally. I used to work as a journalist, and I still have a soft spot for those who are part of this profession. 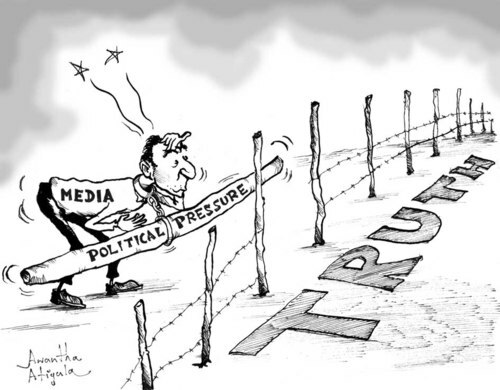 I also know how hard it is to be a journalist, especially one who wants to go after the stories which aren’t press releases, and who will put up with the competing pressures of an editor who wants more breaking news versus the challenge of finding and then getting sources to talk on a particular issue. Last week was a wake-up call for me as to how hard it is to be a journalist today in the Gulf, especially one who works for an organization that isn’t government-controlled and who wants to shed a light on a subject which doesn’t fit the official narrative. This post is for those journalists, and it’s a reminder to communications people in the region why respect and ethics should be central to how they behave. The media gives us the simplest means to view different opinions, be they from government-owned publications or independents. And they get us out of our social media bubbles. Media also allows us to understand the priorities of those who own the media, such as governments. At their best, journalists can ask the hard questions that push us to think through how and why we are communicating. This is crucial especially in the Gulf, where there’s often not enough critical thinking or self-examination. We should never approach the media with the expectation that they’ll run anything verbatim. Likewise, we shouldn’t expect them to run with our narratives, and not ask questions. We shouldn’t expect them to publish our pictures. The media owes us nothing (this is a clear point in the IABC code of ethics). It’s up to us to be as good as we can be as communicators, and ensure that we communicate effectively, transparently, and in dialogue with the media. We can and we should ask questions of media coverage which we believe to be inaccurate. However, what I have seen recently is a trend by Gulf-based or Gulf-focused social media accounts to start calling certain media and what they write as fake and fake news respectively. This mirrors what is happening in the United States. Just because we don’t like something does not mean that we should vilify it. Our job as communicators is to engage, persuade and advocate for our causes. If you can’t do that, then I suggest you go and join the advertising sector. Two other worrying trends are for media to be disrespected or even threatened online (especially female journalists). Another trend is for the narrative and facts to be changed after the fact, including through the use of documents or material which could easily be described as questionable. Again, ethically we must communicate honestly, clearly communicate the facts, and not do anything which we know to be dishonest. Bell Pottinger underlined the need to act ethically. Communicators in the Middle East and especially the Gulf should stand up for ethics. The last thing I want to see is the industry making global headlines for all the wrong reasons. This entry was posted in Journalism, Public Relations, United Arab Emirates and tagged Bell Pottinger, communications, ethics, Gulf, IABC, media, middle east, respect by alexofarabia. Bookmark the permalink.